Want to attach a file to your message in Yammer? No problem – you can upload a file from your computer or select a file on Yammer, SharePoint or OneDrive. At the bottom of the message, click the icon that represents where the file is located. Upload a file from anywhere on your computer. Select a file that has already been uploaded in Yammer. Upload a file from SharePoint or OneDrive. Select a GIF from a list of GIFs available to all Yammer users. Note: Yammer is rolling out changes to file storage for Yammer files in Office 365 connected groups beginning in December 2018. Formerly, all Yammer files were stored in Yammer cloud storage. Once your organization gets these changes, all new Yammer files for connected groups will be stored in SharePoint, but will still accessed from within Yammer. There are a few differences in how you work with these files. To tell where your files are located, and to see what changes to expect, see How do I tell where my Yammer files are being stored?. Select the upload icon . Click Open, and then click Post. Select the Yammer icon . Locate the file you want. The Yammer tab shows files that were saved in Yammer or SharePoint. In the left pane click Recent, Mine + Following, or the group the file is in. Note: The SharePoint tab, available if you're using connected groups, shows files that have been saved in SharePoint. Select All, Recent, or the group the file is in. If you select the group, open the Apps/Yammer folder to find the files added from Yammer, or browse to other folders in the groups document library. Click Select, and then click Post. Select the SharePoint icon . Select the file you want to upload from your SharePoint and OneDrive files, or in your Office 365 groups. OneDrive files are listed in My SharePoint Files > All. Use this option only if you're searching for a GIF from the web. If you're adding a file locally that happens to be a GIF, use the upload a file options. Select the GIF icon . Type a phrase in the Search for a GIF box that captures the essence of what you want to communicate, such as thank you or surprise. Click the GIF you want to use, and then click Post. Q: I get an error when I try to attach a file. Make sure the file is within the limits listed below. 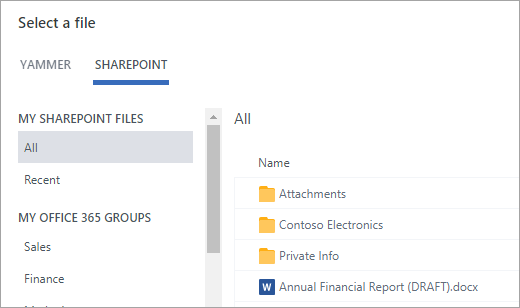 If a file won't attach to a message, try going to the Files menu for your group and uploading the file there and linking to it, or if the group is an Office 365 connected group, try uploading it into the group's Sharepoint document library. Q: What happens to my file when I attach it to a message? A: If the message is posted in a group, it is added to the Files list for the group that the message is posted to. To find the file, select the group, and then click Files and select the file, or go to the message containing the file. If the file is attached to a message in an Office 365 connected group and you have the new save Yammer files in SharePoint feature, the file will be saved in SharePoint. Otherwise, the file will be saved in Yammer cloud storage. If you send a private message with an attached file, it is saved in Yammer associated with just the private message. To find it, click the Yammer settings icon, and then click Files. The group will be listed as Private Message. Q: Can I choose where to upload a file? A: No. If your connected group can save files in SharePoint, all new files for that group will be saved there. All other files are saved in Yammer cloud storage. Q: Can all groups store Yammer files in SharePoint? Q: Can I add files directly in the Apps/Yammer folder in SharePoint and see them in the Files list in Yammer? A: No. To see or search for a file in the Files list in Yammer, you must attach it to a message or upload it to Yammer. Q: Can I edit a file after I post it? A: Yes. For more information, see Edit documents from Yammer. Q: How can I tell if someone else edited a file? A: To follow a file so that you will be notified when a new version is uploaded or when coworkers discuss the file, select the file and then click Follow. To view the version history for files stored in Yammer, in the Files list, click the file and in the right pane, look in the Version History section. For files stored in SharePoint, on the group home page, under Office 365 Resources, click SharePoint Document Library and browse to the Apps/Yammer folder. Hover over the file name, and then in the Show actions menu, select Version history. Q: How can I pin a file to the home page of the group? A: On the home page of the group, in the Pinned section on the right side of the page, click Add, and then select Select a file from Yammer or Select a file from SharePoint. Q: How do other users view a file I posted in Yammer? A: How the attachment is displayed in the feed depends on the file type. Any non-image file attachment is visible as a link under your message. Users can click the link to view the file. Image attachments are visible as a thumbnail under your message. To view the image, users can click the thumbnail. Users can also view and download a file from the group Files list or the Yammer Files list. Click the file, and in the right pane, in the File Actions section, select Download. Q: Who can view files I post to Yammer? A: This is different for Yammer files stored in Yammer cloud storage and Yammer files stored in SharePoint. If the file is uploaded to a public group, anyone in the Yammer network can access the file. If the file is posted to a private group, only members of that group can view and edit the file. You can also share a file with people who are not group members. Network level guests can view and upload files in groups they belong to. Conversation level guests can view files referenced in the conversation, and can upload files to the conversation. External guests can view and upload files in groups they belong to. If the file is uploaded to a public group, any regular Yammer user in the Yammer network can access the file. If the file is posted to a private group, regular users who are members of that group can view and edit the file. Group members can also share a file with other Yammer users who are not group members. Network level guests don't have default access to view Yammer files saved in SharePoint. If you want them to be able to request access to view specific files, they must be added as a Azure B2B guest on the Office 365 tenant. For more information, see Azure Active Directory B2B Documentation. If you want them to be able to upload files to a specific group or have default access to files uploaded to SharePoint, add them as a group member in SharePoint. Conversation level guests do not have default access to any files saved in SharePoint. If you want them to be able to request access to specific files in the conversation, add them as an Azure B2B guest on the Office 365 tenant. They can't upload files. External guests can only be members of external groups. External groups only store files in Yammer. Q: How do I share a file with specific coworkers? A: Either send a private message to those coworkers and attach the file to the message, or if the file is already listed on the Files page, click the file and then click Share. To share with a group, select Post in a Group and select the group. To share with individuals, select Send Private Message and select the recipients. Q: Does search look in the contents of files, or just the file name? A: For files stored in Yammer, Yammer search includes the first 5000 characters of the most recent version of .docx, .pptx, and .pdf format files as well as metadata such as title and author. For files stored in SharePoint, Yammer search only searches the title and author. If you need to do a content search of files stored in SharePoint, you'll need to go to the document library. A: Only the file owner and group admins can delete a file. In Yammer, click the file, and under File Actions section, select Delete this File. Note: Always delete the file through Yammer. Do not delete a Yammer file directly from the SharePoint document library where it is stored, or links to it will remain in Yammer. Q: What happens to my file if I delete the message that I attached it to? A: The file will remain stored in the group in which you posted the message. If you want to delete it, click Files, click the file, and then under File Actions, select Delete this File. Q: When my company starts using files stored in SharePoint, what happens to files we already have in Yammer? A: There are no changes for non-connected groups. For connected groups, existing files stay in Yammer cloud storage and are made read-only. All new files in connected groups are stored in SharePoint. This means that to edit a file that was previously stored in Yammer, you'll need to upload the file again. All future revisions will be stored in SharePoint. For more information, see Edit a previously uploaded file when your Yammer connected group stores files in SharePoint. You can attach pdf files, image files, video files, Microsoft Office files, and more. Each post can have a maximum of 100 files. The maximum size for a single file attachment is 5 gigabytes (GB) for Yammer Enterprise networks and 100 megabytes (MB) for Yammer Basic networks. The maximum dimensions are 7,680 pixels wide and 4,320 pixels high, and the maximum image size is 10 megabytes (MB). The following video types are supported for watching the video inline: .wmv, .avi, .mpeg, .3gp, .flv, .mov, .mp4, .mpg, .ogm, .mkv, .ogv, and .ogg, Users can click the thumbnail to watch the video inline. Yammer uses Azure Media Services to display videos. The maximum size for a single file attachment is 15 gigabytes (GB). There are no dimension limitations for images, but the SharePoint maximum size settings in your organization apply. Any file type can be added. Is my Yammer group connected to Office 365?